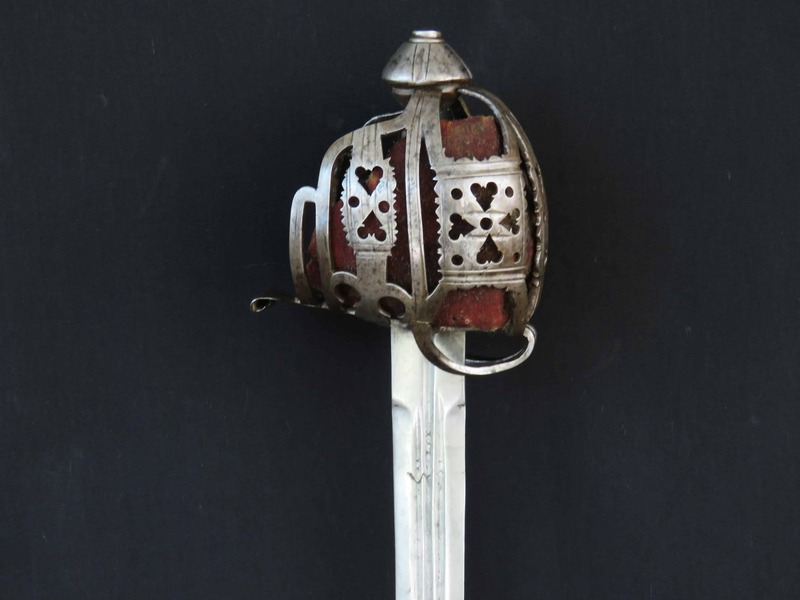 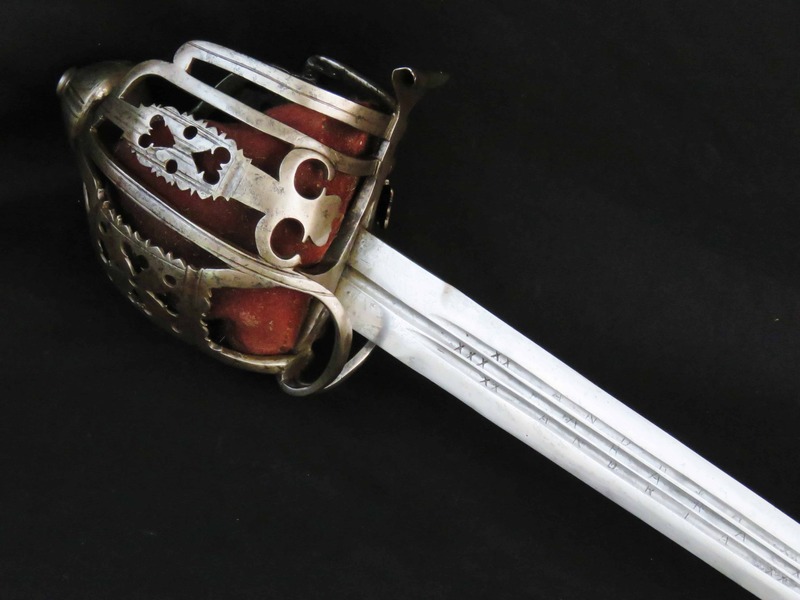 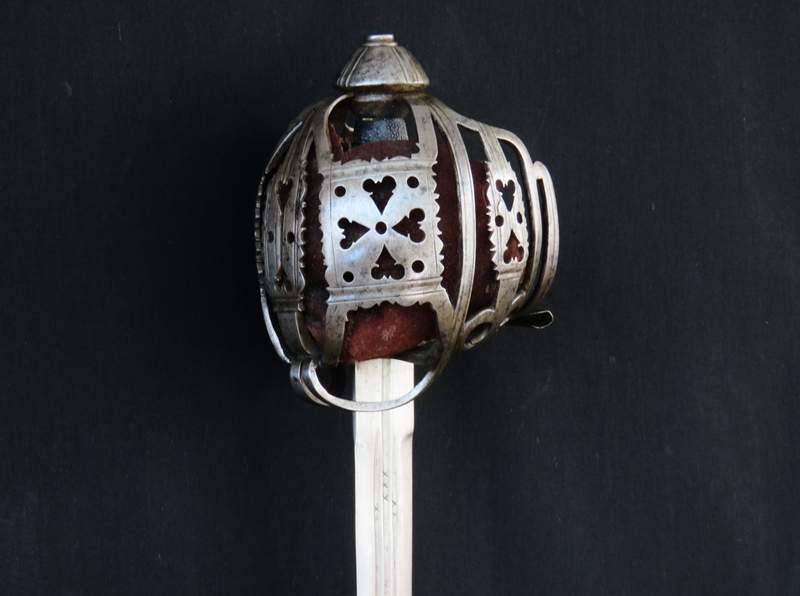 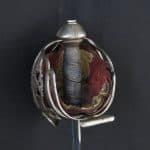 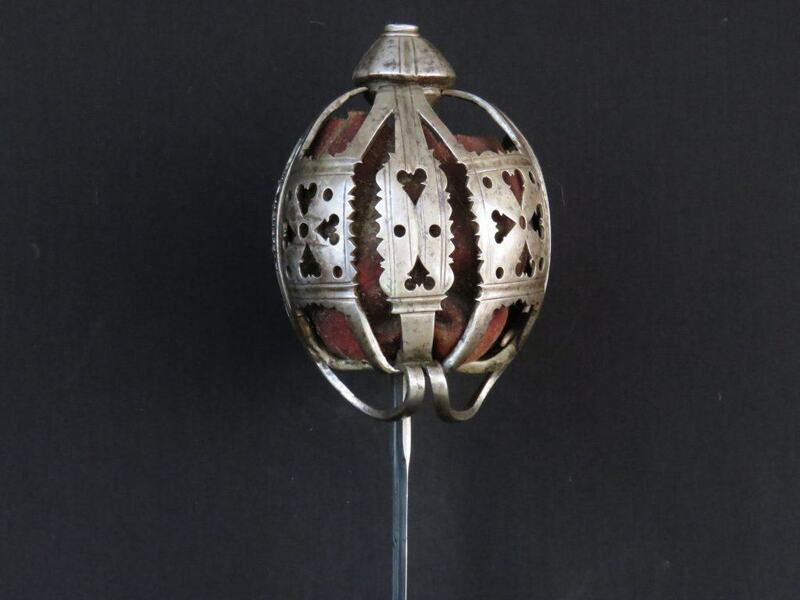 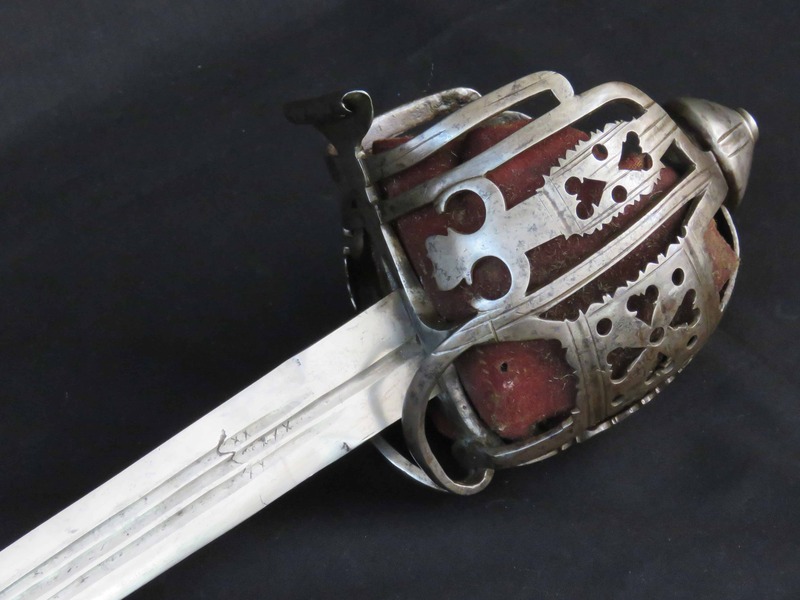 A solid, fine quality and attractive example of an early 18th century Scottish basket hilted broad sword. 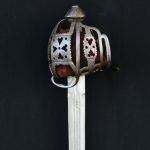 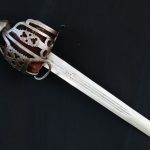 The basket guard is forged from thick well-fashioned iron resulting in a robust hilt, made by an experienced smith, familiar with producing high quality work from this unforgiving material. 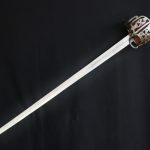 The basket guard consists of flattened structural bars of rectangular section, decorated in typical style, with longitudinal lines incised into the exterior surfaces. 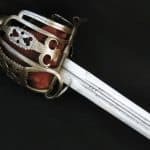 The main and secondary guard panels are finely filed with delicate frets and merlons to the edges and incised with horizontal and vertical lines and grooves. 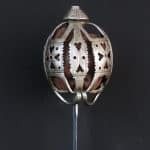 The panels are pierced with patterns of hearts and circles which are well executed, applied in a deliberate, precise and artisan-like manner. 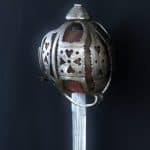 The dome-shaped pommel has a pronounced button on top and is decorated with four equally spaced grooves which radiate from the pommel button, each flanked with narrower incised lines. 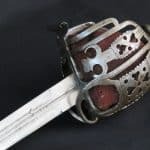 This style of linear engraving is also present along the top and bottom of the two main guard plates and repeated vertically to the middles of the secondary guard plates which are mounted to the sides and centre front of the basket. 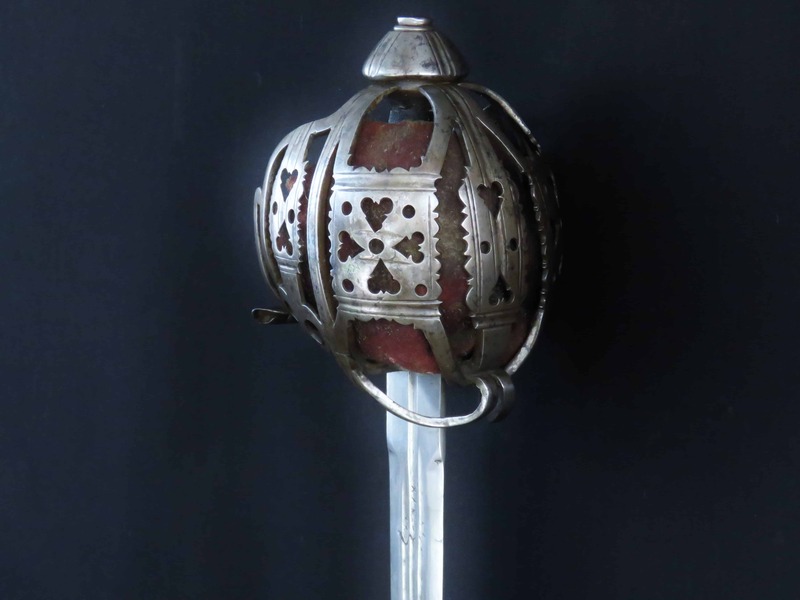 The upper arm terminals of the basket fit into a pronounced chiselled groove which extends for the full circumference around the pommel just below its middle. 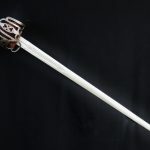 The spirally grooved wooden grip is covered with shagreen and bound with silver ribbon and wire. 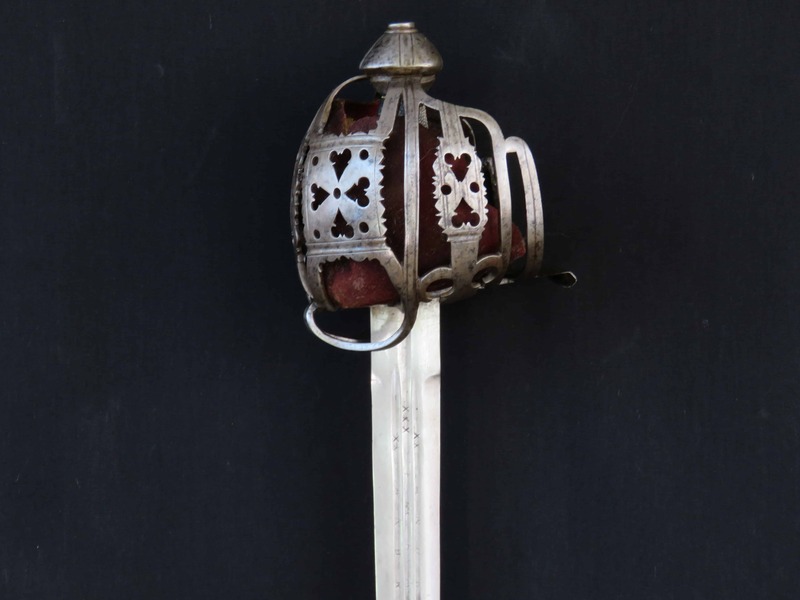 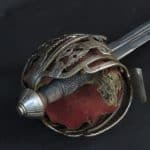 The hilt retains a liner made of red cloth to the outside stitched to a leather lining on the inside now worn. 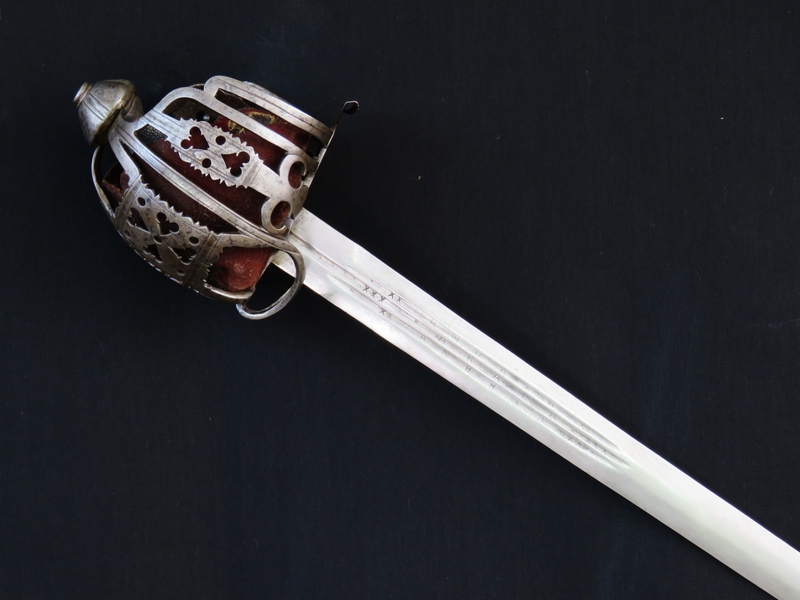 The German (most likely made in Solingen) double-edged “broad-sword” blade is of fine quality and gently tapers to its rounded tip. 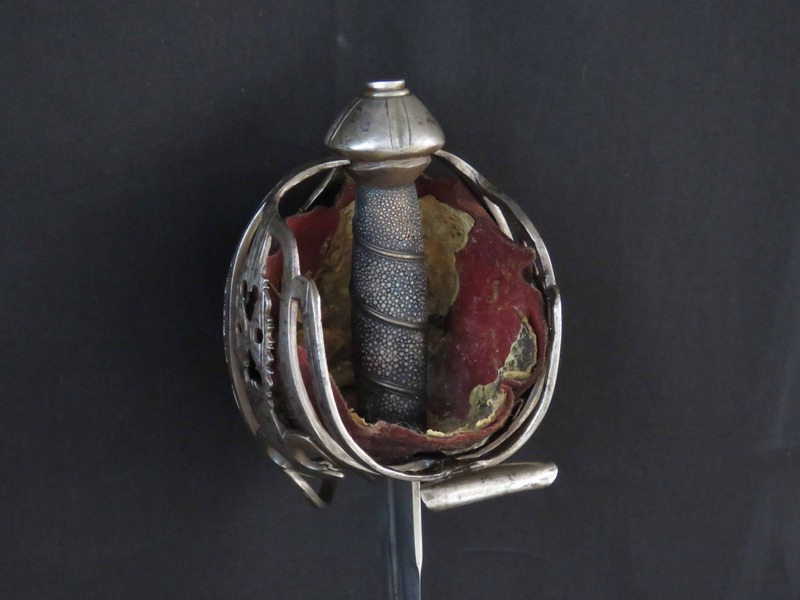 It has a pronounced ricasso extending for 1.5 inches from the hilt after which the blade is sharp on both sides. 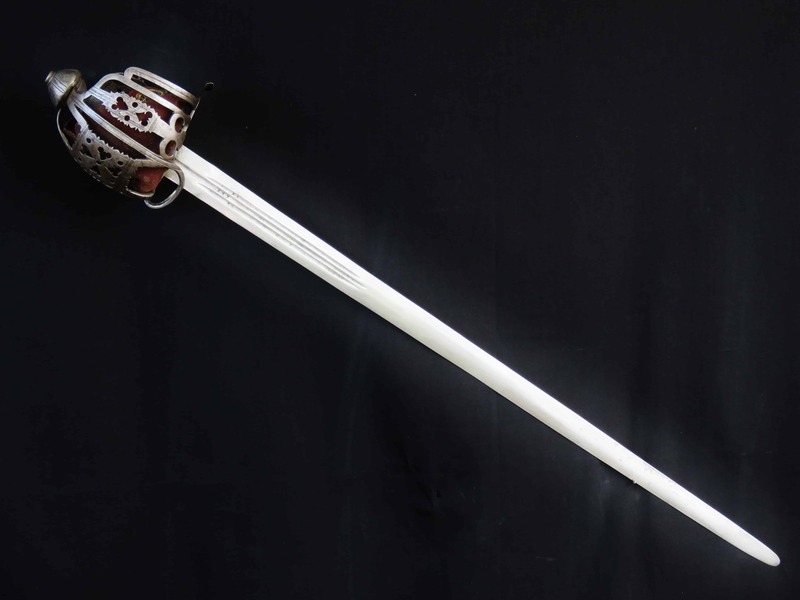 A pronounced fuller extends from the hilt down the centre of the blade and is flanked by two fullers of similar width which commence from the end of the ricasso, all three terminating at a point 9.5 inches (24 cm) down the blade either side, the middle fuller slightly longer, after which the blade is of smooth lenticular section to its tip. 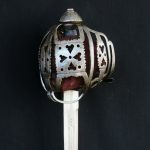 On one side the middle fuller is marked “FARARA” flanked by a triple cross mark and the fuller above and below are marked “ANDRIA” flanked by double cross marks. 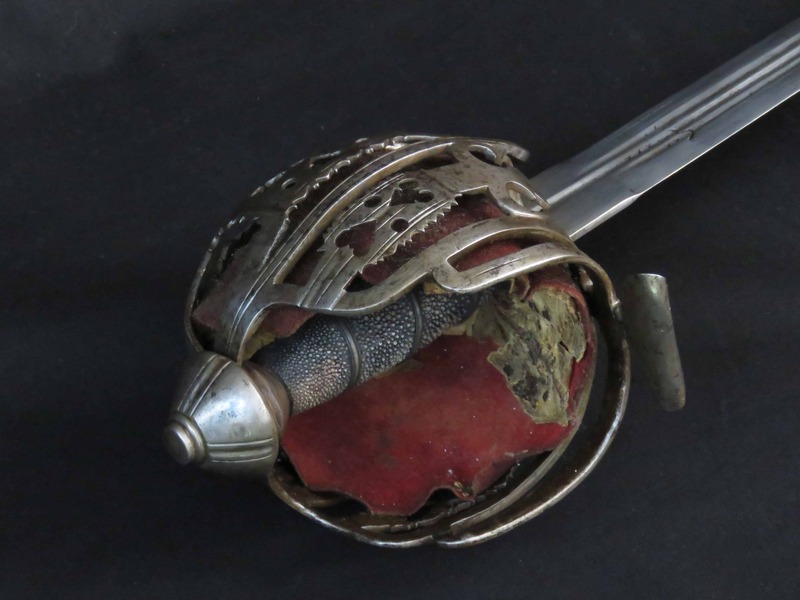 The reverse side was once similarly marked but the letters are now illegible. 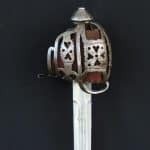 For a similar style hilt see fig F15i, page 115, “British Basket-Hilted Swords”, Cyril Mazansky, The Boydell Press, 2005. 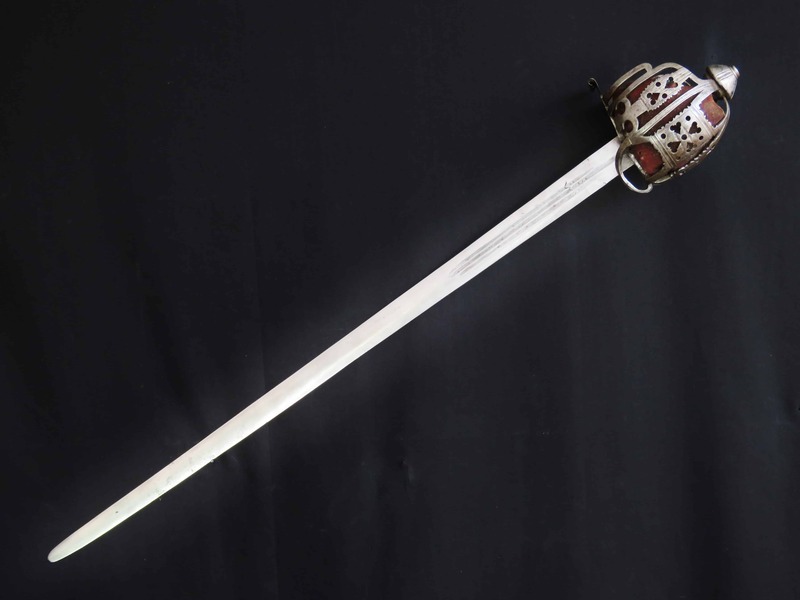 The blade length is just under 32.75 inches (83 cm) and the overall length is 38.5 inches (98 cm).